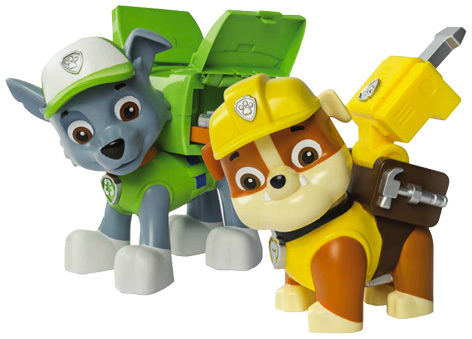 Fans of the Paw Patrol TV series have fallen in love with the Air Rescue Pups from Spin Master. Featuring all the favourite characters of Chase, Rubble, Marshall, Rocky, Zuma and Skye, these pups are all geared up for action in the sky above Adventure Bay. Each one has a special backpack that opens out into a flight pack when you press their special badges. Wings and thrusters transform the Air Rescue Pups into very special pilots. Collect all six for maximum fun and play together with the awesome Air Patroller hybrid jet and helicopter flying vehicle. Other Paw Patrol toys like the Lookout Playset maximise the fun that kids can have with their favourite TV characters. Fires can be quickly dealt with when the On-A-Roll Marshall fire engine drives into view. Check out all the Paw Patrol toys from online sellers and great independent toy shops. Please tell us what you think of the Paw Patrol Air Rescue Pups by Spin Master.